If you are looking for a unique experience in Cuba, a bit different from Havana’s enchanting narrow streets and late night clubs or Varadero’s white sand beaches, then Baracoa is a must. This small town, geographically placed in Guantanamo province, feels like a different piece of land in the Caribbean country. And a fabulous plus, you’ll be nicely surprised by the stunning local food. People from Baracoa are one of the greatest things of this town. Friendly and charming, are there to make you feel like home. Interesting, Baracoa was the first town in Cuba supported by tourism; almost everyone here works in the tourism industry: private houses, car rentals, excursion guides, “paladares” or private restaurant or musicians performing in the main square. So, people grow up with the gift of making their hometown a pleasant place for those coming from the “outside”; doesn’t matter if they are foreigners from Europe or Australia or people from Havana. A curious thing, when you ask people about their province Guantanamo, they say they aren’t not from Guatanamo, they are from Baracoa! They don’t mess with their town here. As almost every private house in Cuba, they will offer more than a bed to lay down. The owners will give you the opportunity to have dinner at home, or making you breakfast in the morning. Based on my personal experience it’s a good option to arrange breakfast at your “casa”, so you won’t spend too much time going out in the morning to find a decent meal, plus breakfasts are usually really nice. A tip, fill yourself properly in the morning, because days here are long and you will need strengths to go up in Baracoa’s mountains. If you decide to enjoy an eco-tourism experience then you have to try any of this trips: climb the Yunque (you can rent bikes in the city centre and go to base of the mountain riding, and later…get ready for big steps! 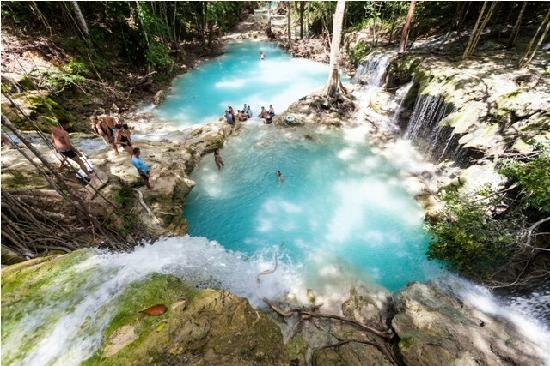 ); another option is go to the biggest natural reserve in Cuba: Humbolt National Park where you’ll find the most exotic birds and flowers and stunning views. Once in Humbolt Park you’ll find there are different paths to go around the park. The hardest but also the most exciting is the one that takes you to a viewpoint called “Balcon de Iberia” including the most relaxing waterfall that you can imagine in your way down. While you are in this kind of daily trip, find food won’t be easy, but if you are prepared is not a big deal. What you will find very handy will be those ladies on the roads selling chocolate bars and coconut cones, the most famous local food. A pure dark chocolate bar will revitalize you anywhere in this city. 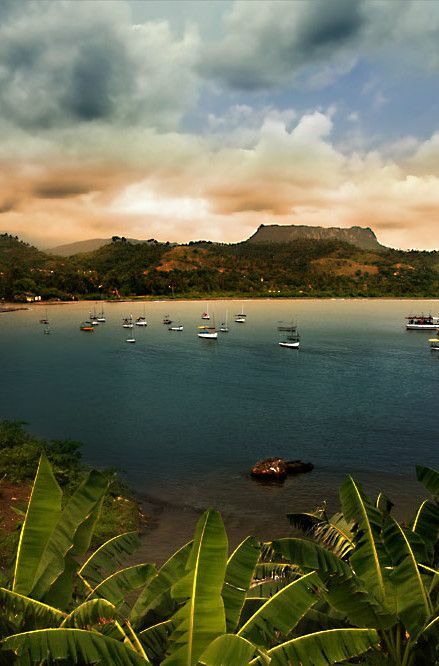 Baracoa is the land of chocolate and coconut. 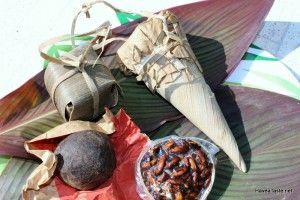 With this two ingredients, local people can make magical courses. Nights at Baracoa were so pleasant for me, mainly because I knew I will enjoy a tasty meal somewhere. Private restaurants are the big deal in town; there are many of them around the city. They are value for money, perhaps not as cheap as you might expect, but good quality food is priceless, right? Seafood is the main issue here: fresh fish, lobster, shrimps and quite exotic ingredients will surprise you more than once. My favorites restaurants were: La Colonial, El Buen Sabor and La Colina. I recommend the fish at the first place, if you like coconut milk then try fish in coconut sauce, a tasty local dish. At the second place you must order a Calalu dish, a vegetarian course, but a lovely one; is another local recipe to prepare steam vegetables gorgeously; and finally at La Colina, enjoy any of their main courses (all stunning) but you must ask for some Daiquiris, because they have the best cocktails in town! Very nice food, fresh ingredients and charming staff. Baracoa is a small town, everyone here knows these places and how to get there; don’t be shy, people love to help and will show the way to get anywhere with a big smile in their faces. Don’t stay at your room at night, go out, hear the music and feel the Cuban heat…and don’t be scare of Mojitos, they will make you feel like nirvana in this small town, surrounded by mountains and rivers, living the real Eastern Cuba. Since years I’ve heard incredible things about Baracoa. People always say it’s a must in Cuba; but until now I haven’t actually realized how amazing this town can be, placed in the middle of the mountains. Located in Guantanamo’s province, Baracoa was the first city founded by the Spaniards in the island. More than 500 years of history and the best cocoa plantations of the Caribbean are hidden in this colourful city. Quite far from Havana: by bus nearly 22 hours of journey, almost 6 hours from Santiago de Cuba and 3 and a half from Guantanamo capital city; however views are just superb. But if you are not a road trip fan then you can go by plane; a two hours flight from Havana using national airlines will get you there. Planes are not the best, but it’s a secure flight and a very pleasant one. The landing is breathtaking: the airport is next to the sea and until few seconds before touch you’ll have the sensation of landing in the water. First feeling when you arrive is the humid heat, quite different compared with the Western, but no an annoying one. A small airport is waiting for you, and also many taxi drivers outside. Baracoa is a cheap town, a taxi to the city centre costs a maximum of 5cuc. Cars aren’t luxurious at all: most of them are jeeps, later you understand why this is almost a compulsory issue in Baracoa. The first thing that actually got my attention was the people: they are the friendliest people I’ve ever met in the country. The city centre is all you ever dream about a small and “vintage” town in Cuba: coloured houses in every corner, traditional music everywhere, art galleries open until 2am, a gorgeous boulevard and ancient buildings. However, at first sight it looks like a really small town and you might think you’ll get bored easily. But believe me; you won’t have time for it. Guantanamo province has 27 rivers crossing the region; 21 of them are in Baracoa. So yes, it’s heaven for those looking for countryside experiences like climbing mountains, taking supernatural pictures and then dive into clear and cold river waters. I’ve never been in such magnificent rivers like those in Baracoa: Rio Miel (Honey River), Yumuri River or Toa’s (the biggest river in Cuba). But there are also stunning beaches like Maguana Beach (placed 45 minutes by car from the centre and located on your way to Holguin) and Manglito Beach (this in the opposite side, on the eastern). White sands and blue waters are virginal waiting for visitors. A plus: private houses on the first beach line offer incredible appetizers to enjoy beach time: seafood and tasty tapas will make you feel in paradise. All this things are great, but they are far away for being the best thing to do here, in the middle of nowhere. The mountains are the greatest attribute of the city: climbing the Yunque Mountain is one in a life time experience. More than 2 and a half hours of hard work to get to the top, natural made paths, exotic nature, tons of cacao plantations, plus a marvelous waterfall when going down are literally heaven in Earth. The view of all Baracoa and pretty much all the region will leave you speechless; and the sensation worth the effort of going up more than 575 metres over the sea level. SCUK can make a perfect trip for you! Placed in the middle of the Caribbean, Cuba as a big picture can be divided in three main regions: Western, Central and Eastern Cuba; each one with their own particular characteristics but all sharing the charisma of their people. Central Cuba is a very special one; not having Havana or Santiago de Cuba don’t make it less exciting. If you are looking for history, stunning ancient villages and wild nature, then you must stop here. From Santa Clara to Camaguey, Central Cuba hosts magnificent colonial towns as Trinidad. The region is divided between the beautiful mountain range called Sierra del Escambray to the south with its tropical vegetation and sugar plantations. Agricultural plains in the north are quite famous its dairy farming and fruit plantation. Plus the stunning cays in the north side and marvelous white sand beaches in the south. I read once Trinidad is the loveliest example of a colonial town in Cuba; it’s probably a true statement. 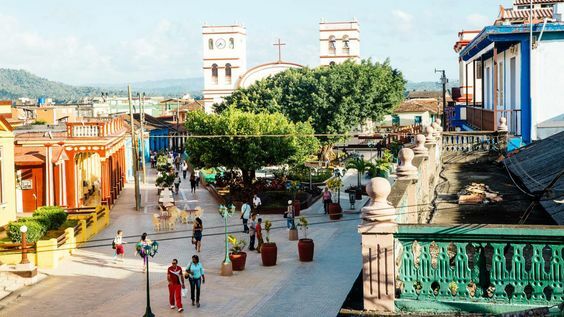 Founded by a Spaniard conqueror as a base for gold mining in the heart of Sierra del Escambray, it was not until the beginnings of 18oo’ that this charming town became one of Cuba’s most important centres for sugar plantation and of course, slaves. History is and beautiful constructions are the core of this town. Its colourful buildings and colonial mansions will make you fall in love with this land; cobbled streets will make you feel like waliking in the 18 century movie. Today Trinidad is a UNESCO World Heritage Site, a well-deserved honour. Central squares and streets have been restored and local homes have been brightly painted. Music has flourished like nowhere else and seems to govern every street; from musicians who stand up almost anywhere when ther aren’t playing at a bar or in the famous Casa de la Trova. As a plus, on the Trinidad side of the range stands Topes de Collantes. It’s a mountain resort built at the height of Russian influence. It’s worth a curious look and is perfectly situated for long walks. Did you know Cienfuegos was founded by French immigrants from Bordeaux? Its boulevards have French elegance all around them, and you can note the architect difference with other Spanish founded cities. One of the main attractions is the Jose Marti Park, a wide square with a triumph arch surrounded by palm trees. Also the Palacio Valle shows an extraordinary European influence style; a Moorish palace facing the stunning city bau, nowadays a fine restaurant. Founded in 1600’s last decades by citizen of Remedios trying to escape from pirates this city is today one on the main cities in Cuba. The last battle of the Cuban revolution, back in 1958 took place at Santa Clara headed by Che Guevara. Locals fell in love to the revolutionaries and until today remains a very passionate city. If there is something you shouldn’t miss by any chance is the Che Guevara Memorial; the huge bronze statue of the Guerrillero stands heroically above the Museum of the Revolution is a must: a Cuban hallmark. Founded in the 16th century this wonderful town rises in the road between Santa Clara and Cayo Las Brujas (north coast). Much of the city was destroyed by a fire and nowadays most of the constructions date from 19th century. Nevertheless, his unique neoclassic streets worth a moment to admire; it also has two of the oldest church in the Caribbean. Simply beautiful, this city may stole your heart; not few visitors have return over again to breathe and feel this town spirit. The Hairdresser’s Alley (Callejon de los Peluqueros) is becoming a trendy place in Cuba’s capital city to have a good time. Squeezed within Old Havana’s narrow streets, the singular alley is more than a place to have a lovely meal or try a “forbidden” drink; is a vividly proof of Cuban people wishes. Located in Aguiar Street, Old Havana just a couple minutes walking from Havana’s Malecon (seaside promenade) and 4 minutes from the Museum of the Revolution; only has 100 metres length but you wouldn’t imagine the life hidden in this singular alley though. Bars, restaurants, art shops, places to admire collectable pieces and famous hairdresser’s salons harmoniously coexists and make this place a unique one in the heart of Cuba’s capital offering more than meals and objects to buy, but showing the truly spirit of the city. It used to be a forgotten place, nothing but dirt in the streets. However, a few years ago it was refurbished with government’s support and local people aiming. The goal was to give life a social project in this community; but today is more than that. Nowadays The Haidresser’s Alley receives a flood of tourist and local people. Most of them interested to know how it actually works while others just get fascinated with the colourful alley. The project was born after a private business opening headed by a local guy. The beauty salon also house-museum property of the hairdresser Gilberto Valladares (mostly known by the nick Papito) was the origin. Papito started financing the alley with his business profits by his project Arte Corte; and without knowing it he started a brilliant financial experience in our socialist Cuba. This area in Old Havana named Santo Angel (Saint Angel) became a special one. Bars and restaurants are making more attractive these beautiful scenes. As part of the social aiming, owners employ local people for their business: taking care of gardening and vigilance during night. Places like “El Figaro” are getting very popular to enjoy a good plate of food. Famous for their Lobster in coffee sauce and Pork Fajitas (strongly recommend this last one) is now a trendy location; even the Rolling Stones had been there. Very “European” style decorated is now popular for signing notes or bills and the staff hang them in a cord crossing the bar. The Rolling Stone’s note is already hanged…(so it’s one sign by my friends and myself one night!). The place is very value for money with main courses starting at 6 CUC; also the cocktails are very nice. But there is another place I love to go: Café de los Artistas (The Artists Cafe). A high ceilinged, well restored building from the 1880s engaging owner Luis Carlos (the Stage Manager of the nearby National Ballet) serves straightforward menu with a selection of lighter fish and pasta dishes and very refined traditional Cuban food. As well as El Figaro it has reasonable prices and really worth the try! Locals love going here to have a meal with friends; is getting trendy to celebrate birthdays as well. Just a tip: if this is your aim, then you must book a big table first! The staff is really nice, and (if you want another tip), in this place I had one of the best Gin Tonic in Havana. I heard once this that Café de los Artistas is an unpretentious dining spot; that was before going. Now I assure you, the place is just perfect if you are looking for a good time and a piece of heaven in the crowded city. There is also a place named La Farmacia. No personal experience here, but it’s definitely the next place to go in this magnificent alley. If you are in Havana, well you should give it a try; I bet you won’t regret about it!